Years ago I tried Monkey Bread and thought it was the greatest treat ever. Then as all things go, people weren’t content with this humble little pull-apart bread and soon created Gorilla Bread. My friend Gina brought Gorilla Bread to one of our friend gatherings and we have all been hooked ever since. Today I made a cross between a Monkey Bread and a Gorilla Bread so I’m calling it Monkey Bread with Sass. I made this with canned biscuit dough but one day I want to try it with homemade biscuit dough. Takes the “easy-peasy” out of the recipe but I think I would love the homemade taste. For now, it is just a plan for another day because I’m using the canned dough today. 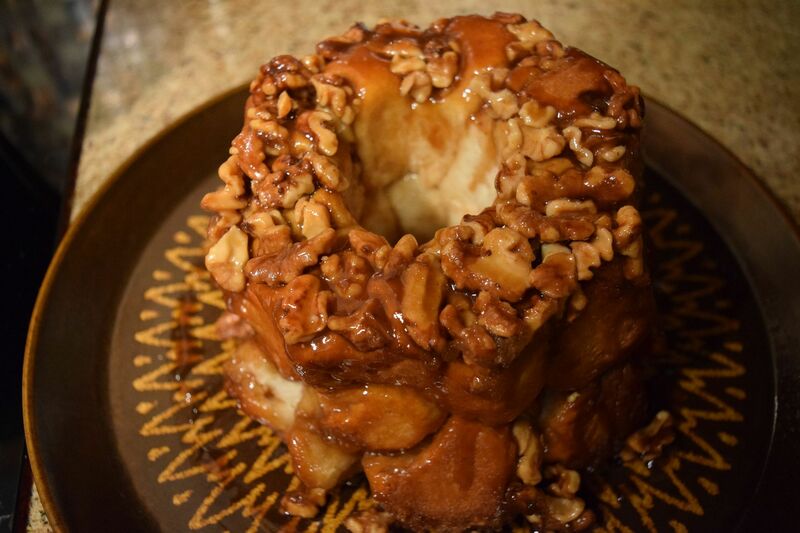 This Sassy Monkey Bread goes together in minutes but takes about 45 minutes to bake in my pan. You have to get up early to get this on the table. Part of the length of cooking is my pan. 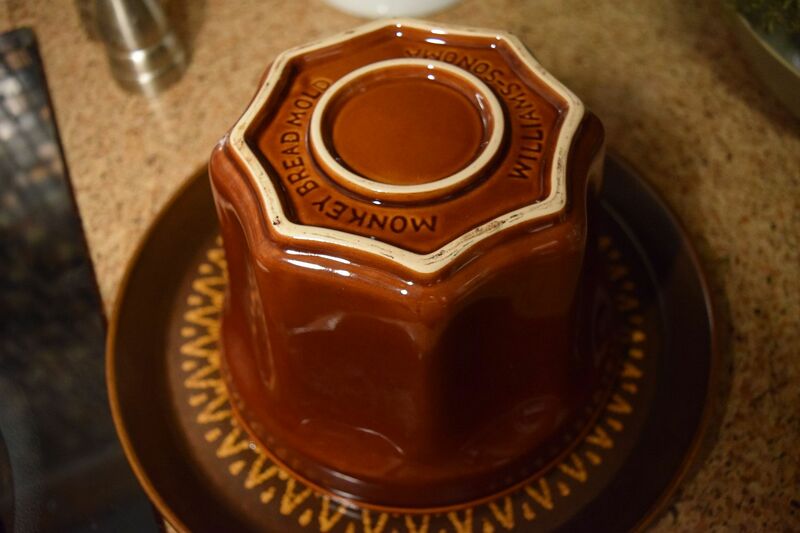 I bought a Williams Sonoma Monkey Bread Ceramic Dish and the sides are incredibly steep so I think it probably takes longer to bake than a conventional Bundt or angelfood pan. Time to take down all my beautiful Christmas decorations so this bread is perfect for picking as I’m packing! 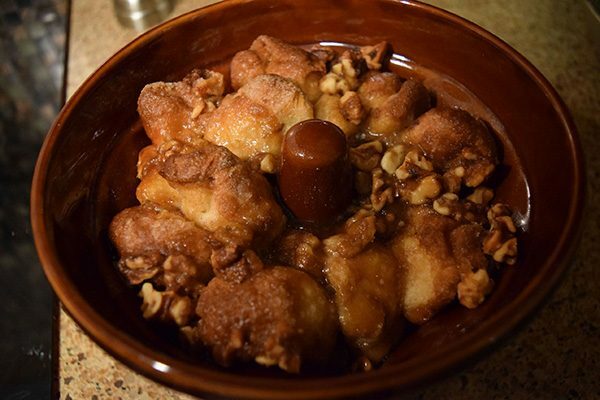 Grease a Bundt pan or Monkey Bread Dish. Open biscuits and slice each into fourths. 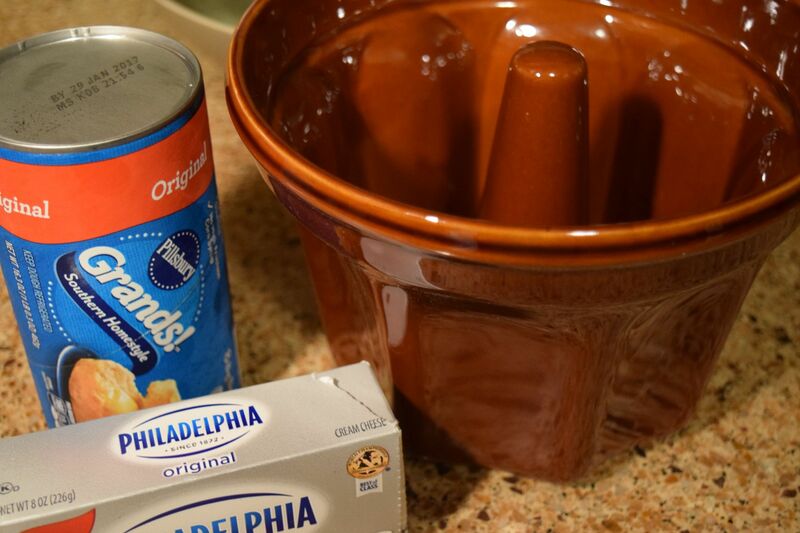 (For Gorilla Bread you can leave the biscuits whole and cut the cream cheese into larger pieces) For Monkey Bread, score the cream cheese into 40 pieces – about 1/2 teaspoon. Mix together the cinnamon and sugar; set aside. Heat the butter and brown sugar; keep warm. Take a piece of the biscuit dough and press it larger with your fingers. Sprinkle with cinnamon sugar. Place a piece of cream cheese in the center and wrap and seal the dough around the cream cheese. Roll in sugar mixture. Repeat with remaining dough. To assemble – place 1/3 of the nuts in the dish, top with 1/2 of the dough pieces, 1/2 of the butter mixture, and sprinkle with 1/2 half of the remaining sugar mixture. Repeat layers ending with nuts on the top. Bake for 30 – 45 minutes depending up what type of pan you are using and whether you double the recipe. Test for doneness by looking down into the biscuit balls and making sure the middle layers are cooked through and not gummy. When done, remove from the oven and let sit for 5 minutes. Place a plate on top and invert. 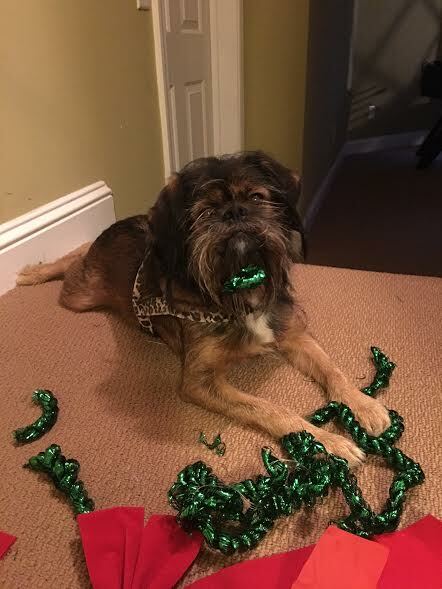 Thank you, Chupa, for your assistance, however it might be nice to be able to use the decorations again next year although you do look fetching with your beard garland. Looks delicious…but how about posting recipes for those of us who cannot indulge ourselves in high carbohydrate food? I will. Can you tell me the number of grams of carbohydrates to shoot for in each recipe? Not a daily amount but a typical amount for an entree or meal? Yummy!! Makes me crave Gorilla Bread!